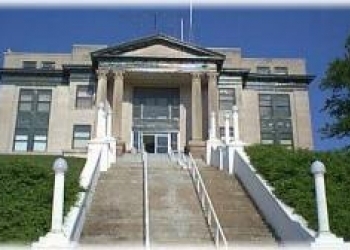 The Board of Osage County Commissioners met Monday morning at the courthouse in Pawhuska and got several things accomplished. The Commissioners spoke with Paul E. Despain of AT&T about a strained relationship that had been building over the last several years regarding poor communication between AT&T and the county. After discussions between the Commissioners and Despain, it seemed as if both parties had a better understanding of how to proceed moving forward. At an earlier County Commissioner meeting, the board had sent out bids to see what the cost would be to make security improvements to Judge Kane's chambers area. There were three bidders and the Commissioners chose Kyler Construction Group out of Ponca City. The County Commissioners also signed a resolution, allowing bids to go out and begin improving the women's building at the Osage County Fairgrounds. Jeff Raley, a lawyer out of Norman, was also on hand to discuss the possibility of having another county-wide vote to build a new courthouse. There was a vote years ago and it failed by a wide margin. In honor of President's Day, the next regular scheduled County Commissioner meeting will be next Tuesday at 10 in the morning at the courthouse in Pawhuska.